Today was zentastic. We had a blast at VERONICA’s Voice playing with Zentangles. I demonstrated some of the different zentangle patterns on a large format while the group played on some squares I cut from Bristol paper. 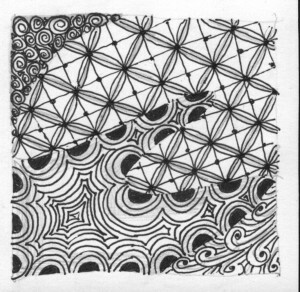 My favorite part was seeing the unique zentangle patterns that were being developed in the group. They didn’t need a demonstration, they just took off in the zen zone. As always, I forgot to take photos. Perhaps I should hire a full time photographer to document my life. Then when I would like to show you what happened, I’ll have more than words. And on another happy note, my Winter 2010 Class Schedule will soon be posted. I’ll be offering Introductory Soldering: Making Jewelry and Visual Journaling: Discovering Self Through Imagery. I’m also developing the next level of soldering in which we tackle cutting our own glass, and will be offering this in Spring 2010. © Amanda Jolley. All rights reserved.